The absolutely gorgeous Amish Geneva Sideboard will have more family and friends visiting your dining room or living room to catch a glimpse! This beauty is stunning in with its simple shaker ways. Solid wood fashioned to store and serve. Host and enjoy a mini-bar or put out a collection of snacks for visitors. In the meantime, this shaker style furniture will make a lovely addition to your home furniture collection. 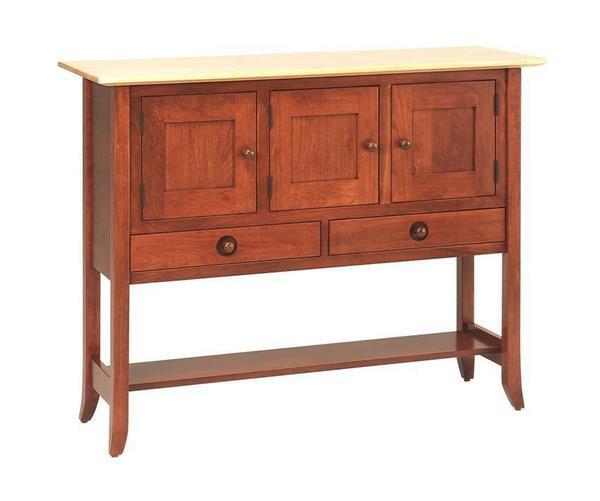 The Amish Geneva Sideboard is shown here with a cherry wood base and hard maple wood top. You've come to the right place for unforgettable furniture that can become part of your family's history. Customize to achieve the look you love. Our Furniture Specialists are available by email or phone to help you. Thanks for shopping with us.